Home/Newsworthy/Is Norway shifting to pro-Israel Policies? Is Norway shifting to pro-Israel Policies? The international evangelical founding director of the Brussels-based European Coalition for Israel (ECI), Tomas Sandell, met with Members of Norway´s Parliament, Stortinget, today to communicate perspectives about a stronger European and global stance for the State of Israel. The meeting in Parliament was held by the «Israel Friendship Association», consisting of 36 members of Parliament from most political parties. The Chairman is Hans Fredrik Grøvan of the Christian Peoples Party (KrF). The highest ranking MP´s in attendance today were Per Sandberg, the Vice-Chairman of the Progress Party (Frp) and Hans Olav Syversen who is the Parliamentary leader of the Christian Peoples Party (KrF), and the Chairman of Parliament´s Finance Committee.. The topics that were covered were about international law, Palestinian-Arabs right-to-return, unilateral Palestinian declarations, the future of a Palestinian state, corruption of international aid to the Palestinian Authority (PA), boycott of Israel, Israel´s innovation power in academia and technology, Jewish settlements, the status of Jerusalem, Norwegian cooperation on the Middle East with the European Union, European nations, and international bodies etc. The introduction by Sandell and the ensuing discussions were held in a cordial and direct tone. Hans Fredrik Grøvan expressed great satisfaction with the meeting: - This has really broadened our understanding, he said. Several Members of Parliament expressed their perception that there is a gradual shift of Norway´s official foreign policies toward a more pro-Israel stance. 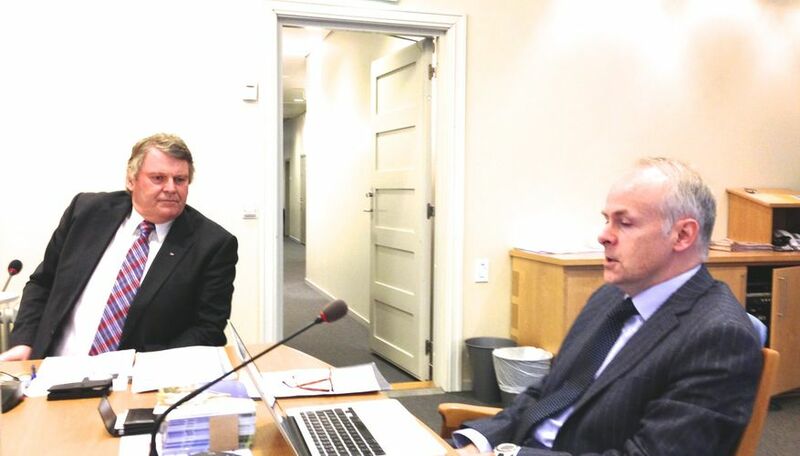 Tomas Sandell was accompanied in Parliament by the businessman Eirik Daniel Hansen of Morgenstjernen AS, and h, is host in NorwayConvenor of European Coalition of Apostolic Leaders (ECAL), Jan-Aage Torp, who . Afterwards, Tomas Sandell addressed, consulted and prayed with a group of distinguished evangelical leaders from Church and business about Norway´s relationship with Israel.